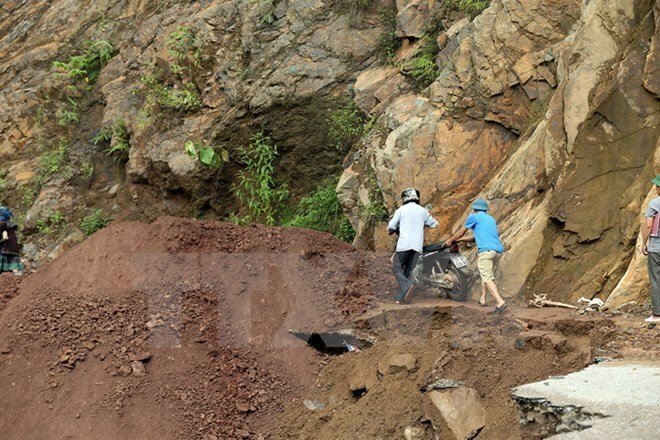 Cao Bang (VNA) – A landslide triggered by prolonged rains over the past days killed a man in Ron Ru village, Tam Kim commune, Nguyen Binh district of the northern mountainous province of Cao Bang on August 6. Hoang Sun Chieu, born in 1965, and his wife were on their way home from the field when a mass of soil fell down the mountain, sweeping Chieu down the abyss. Chieu’s wife was lucky to survive. Heavy rain has poured down in many northern provinces over the past week, causing flash floods and extensive damages. Yen Bai reported five deaths and nine missing cases as of August 5, while 12 people were killed and three other went missing in Son La.